Aymen Sherwani is an undergraduate student at the University of Calgary who hopes to one day go to law school and pursue a career in criminal law. In 2018, she started volunteering as a Program Resource volunteer with the Elizabeth Fry Society of Calgary, having now moved to a new position as a Traffic & Bylaw Court Volunteer. 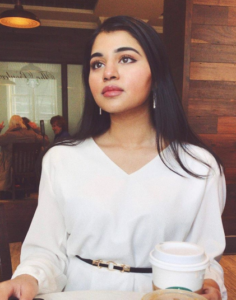 Aymen first became involved with the organization because she wanted to gain more knowledge and experience within the legal system while giving back to the community and understand racial inequality in Canada. When asked why Elizabeth Fry Society of Calgary was her choice of organization to work with, she replied “At the time, I was looking for a meaningful cause to dedicate my energy and time towards. I applied to the Elizabeth Fry Society with the understanding that I would be volunteering to directly aid previously incarcerated women, or women in need…” In addition to volunteering for a school newspaper as an opinions columnist, Aymen publishes articles and poetry, and practices karate. What has working with the Elizabeth Fry Society taught you, both in your personal and professional life? Why do you believe the community should be supporting the Elizabeth Fry Society? How has your role with the Elizabeth Fry Society changed you as a person? How do you think it has changed or impacted those who’ve come to its doors seeking help?